Several months ago the folks at Lake Erie Toolworks sent me a “Moxon Vise” to try out. I use their other high-end workbench vise screws in my workshop, so I was eager to see how their Moxon Vise would perform. They are offering a brand new Moxon Vise as a giveaway for my readers, which you can enter to win at the bottom of this article. The giveaway is open world wide, so make sure you enter! What is a Moxon Vise? 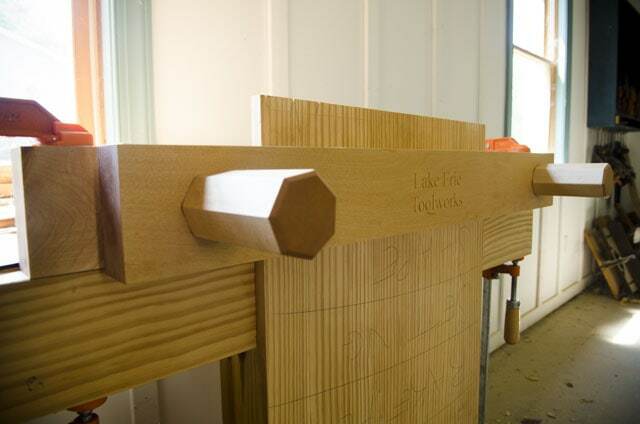 So what is a Moxon Vise? A Moxon Vise is a portable workbench vise that can be clamped to any workbench surface. It’s double wood screws offer a very wide opening for clamping wide boards & panels, and is especially popular for dovetailing. A lot of woodworkers also like moxon vises because they offer a way to raise their work up a bit higher. 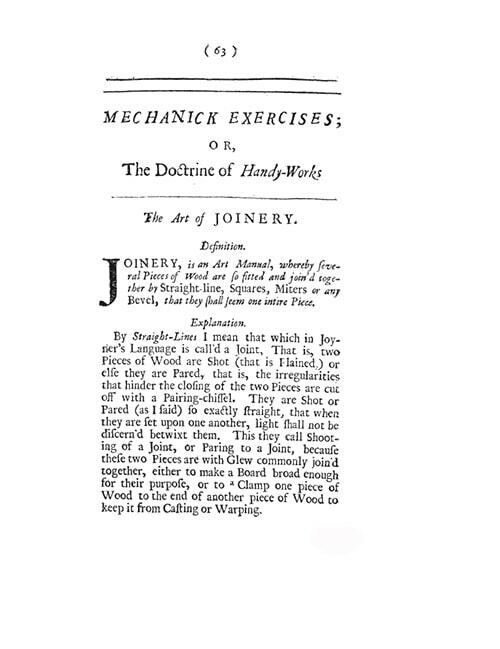 “Moxon Vise” isn’t the official name for this type of vise, but it was a name coined by author Christopher Schwarz as he was reading about a portable unnamed vise that he saw in Joseph Moxon’s 17th century book “Mechanick Exercises or, The Doctrine of Handy-Works“. You can read more about Schwarz’s discovery of the Moxon Vise here. 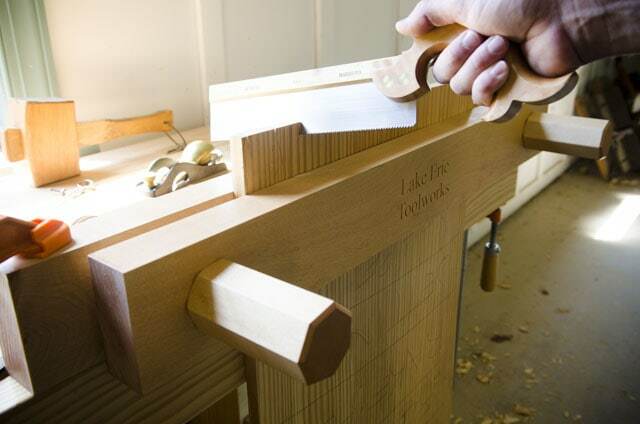 The Lake Erie Moxon Vise is made of hard maple and can accept boards up to 24-inches wide. 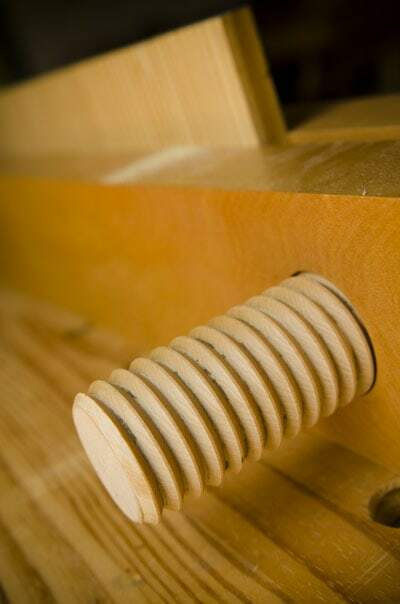 The wood screws are exceptionally well-made and smooth, and offer incredible clamping power. You can purchase the Moxon Vise and see all the specs and product video here on Lake Erie’s website, or you can also purchase it here through Highland Woodworking. I believe Highland Woodworking has some in stock if you don’t want to wait the 2-3 week lead time on Lake Erie’s website. The below workbench is still under construction, so this Moxon Vise has been a great addition while I’m working on building the leg vise. I first learned about Lake Erie Toolworks from Will Myers (the presenter of the popular “Building the Portable Moravian Workbench with Will Myers DVD). Will has built scores of workbenches in his workbench classes and outfits all the student’s Moravian Workbenches with Lake Erie’s wood vise screw kits (here). They have always been the highest quality wood turnings and will last a lifetime. A couple of my own workbenches also have these wood vise screw kits and they’ve worked wonderfully. You can also find both the wood vise screw kit and wagon vise kit in stock at Highland Woodworking’s store here. Lake Erie’s moxon vises come machine-smoothed, but they suggest that you go over them with some fine grit sandpaper (220 or 320) and then finish everything (minus the screws) with Danish Oil. This was only about 15 minutes of prep work, which was no problem. I’ve been very pleased with the convenience of being able to easily hold my panels in one vise rather than using half of a normal face vise with “creative” clamping techniques. Over the past few months I’ve also gained an appreciation for the extra 6-vertical-inches or so that I don’t have to bend over. I have a friend who even adds extra blocks under his Moxon Vise to further reduce back fatigue.